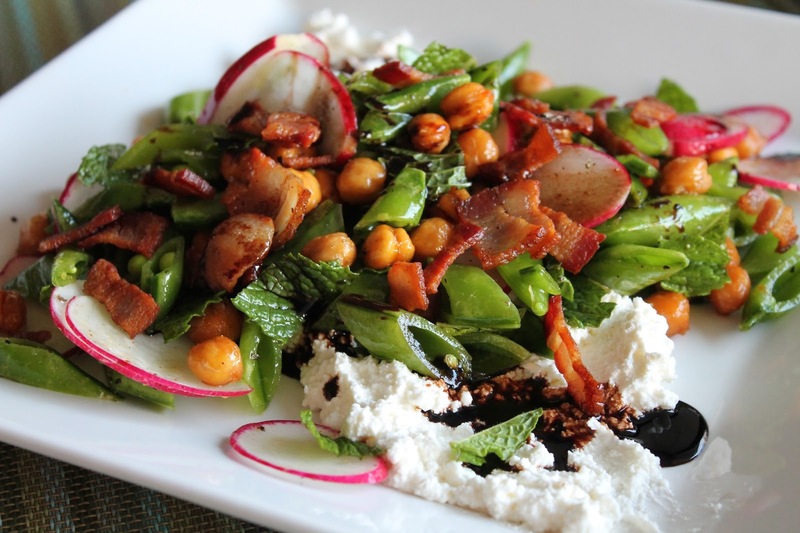 This colorful spring salad is all about contrast, both in flavor and texture. 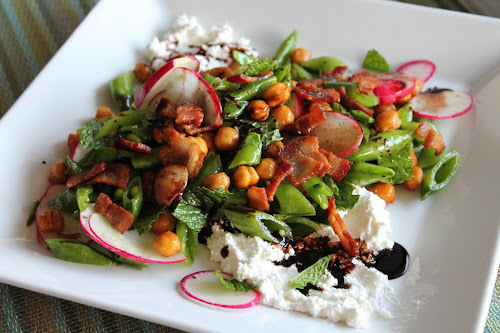 It mingles smoky chewy bacon with crisp raw sugar snap peas, earthy roasted chickpeas and creamy fresh ricotta. A drizzle of reduced balsamic vinegar adds a touch of sweetness. 1. Preheat oven to 425 F. Combine chickpeas, 1 tbsp. olive oil, seasoned salt and smoked paprika in a medium bowl and toss to combine. Spread chickpeas in an even layer on a baking sheet and roast until browned and a bit crispy, about 15-20 minutes, stirring halfway through. Set aside to cool. 2. Heat a medium frying pan over medium heat. Cook the bacon until cooked through (lightly browned and crisp). Transfer bacon to a paper-towel-lined plate and set aside. 3. Heat a small frying pan over medium heat. Add the balsamic vinegar and cook until reduced by half. 4. In a large bowl, combine sugar snap peas, radishes and mint. Whisk together remaining 2 tbsp. olive oil with salt and pepper and pour over salad ingredients. Toss to combine. 5. Divide the ricotta and spread it on the bottom of two plates. Divide the dressed ingredients and place on top of the ricotta. Top each plate with half of the roasted chickpeas, half the cooked bacon and a drizzle of half the reduced balsamic vinegar.